*Comic-actor Sinbad has been around forever, it seems, but despite his many years in the business, not much is widely known about his personal life. For instance, you might be surprised to know that Sinbad and his wife, Meredith, divorced and remarried. You might be surprised to know that Sinbad had a wife in the first place – or two grown children, Royce and Page. Thanks to the magic of reality TV, you’re going to discover almost all there is to know about Sinbad and his family. His WEtv show, “It’s Just Family,” is set to debut on Tuesday, April 12 at 10 p.m.
Really? The only so-called comedian that’s worse than sinbad is the dude who played “skippy” on the show families ties. What’s with all the Sinbad bashing that I’ve run across on the web lately? I can think of a lot worse comics that are still around other than Sinbad. He’s never been very funny IMO, but I always liked his personality. I did like the movie Houseguest, but as far as his stand-up comedy material….not a fan. The house looks empty..is it really their house??? His wife (ex-wife and wife again) and that singer, Tracie Spencer, that he cheated on her with resemble each other. When did the two of them remarry? Despite his shortcomings, I like Sinbad and always enjoyed his comedy shows. I’m a very intelligent human being and I don’t need all of the cursing and vulgarity in order for comedy to be funny because I can think, enjoy thinking and can use my brain in order to get a joke if necessary. Sinbad can also be simple as hell, which can also be very funny when done right and it’s something he does well. Haven’t seen him in a while so I’ll watch the show to see what’s up. Is the wife’s sidekick really necessary? We don’t really care about either of them. We’ll be watching for Sinbad for the most part so, her moral support should be off camera. Thanks “brooklynbabe” for the positive message, and I agree his comedy is simple and funny in where my kids can watch w/o covering their ears. I also hope you know he’s doing this for the money as well but who’s not…. 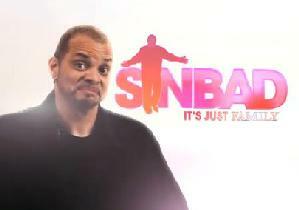 I have to agree with brooklynbabe, Sinbad is very funny and I have always enjoyed his humor. I think you do not have to use profanity all the time to be funny. He is coming back on a reality show. I know he had financial problems a while back so, I am guessing the reality show is paving the way for his comeback.